The Hilditch Group have been conducting catering auctions for over 20 years. We offer a complete service to the hotel and licensed trade for the valuation and disposal of all types of catering and hospitality equipment, as well as being a leading source of good quality used equipment for the industry. Our highly respected catering auctions are held once a month and attract vendors from a wide spectrum of the hospitality industry, including many of the major catering equipment manufacturers and stockists. We also run specific online auctions for catering equipment. Our sales include everything you would expect to find in a hotel, pub or restaurant; including catering equipment of all types: cutlery, flatware, pots and pans, tables and chairs, and even chefs clothing. We are uniquely positioned to advise on the saleability and value of catering and other assets, plus options for the full clearance of a site – maximising returns from profitable assets and minimising costs. We offer commercial valuation services both for accounting purposes and the sale of equipment. Our sales are the first place to look for new, ‘B’ grade, second hand or used catering equipment at a fraction of the retail price for your catering or hospitality business. Outfitting a commercial kitchen can be expensive and, increasingly, people are looking to quality used or ‘B’ grade catering equipment as huge savings can be made on the original retail price. Our catering auctions are the ideal place to outfit your kitchen. 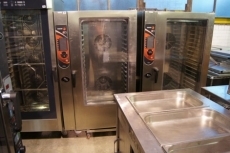 We sell new, ‘B’ grade, used, reconditioned, second hand and clearance catering equipment. Equipment will range from “as new” ex-display catering equipment to stock being replaced under refurbishment or for parts. Commercial kitchen equipment is designed to last many years if used correctly and cared for. Pre-owned kitchen equipment can often be purchased at 10-15% of the original purchase price. We always recommend buying quality used equipment that is built to last and will have spares availability, rather than cheap generic product from the Far East, which often does not have any spares back up. Where does the catering equipment we sell come from? Major manufacturers and distributors, kitchens from NHS hospitals, bistros, licenced premises and liquidations of hotels. What to look out for when buying used catering equipment? Buying pre-owned catering equipment is considered risky if you do not know the equipment, but if you buy with care you you can outfit a commercial kitchen for a small capital outlay. While all items are sold as seen in our catering auctions, and the buyer must satisfy themselves of the condition of the item, we describe any known faults and equipment is freely available to view and check. What is in our Catering Sales? If you have any queries on items in our sales we are happy to check and advise, although it is always better to view equipment if possible. Our auctioneers and sale staff have a wealth of experience of catering equipment and are always happy to share this. If you are looking for specific items we can advise you when these come up, but if it is general commercial kitchen items, the answer is we have examples in every sale!!!! If you are looking to sell kitchen equipment we are happy to advise on options and conduct valuations. We can rapidly collect equipment if required and regularly conduct restaurant and kitchen clearances to tight schedules. If you require an outright purchase of equipment we can do this, but as auctioneers we prefer to sell on your behalf for the best price. As we hold catering auctions monthly, as well as online and onsite sales, we can rapidly sell your redundant catering equipment.